BOSTON -- The arrest of a man with a rice cooker in his backpack near the Boston Marathon finish line led police to step up patrols Wednesday, while organizers sought to assure the city and runners of a safe race next week, and his family apologized for his alleged actions. The actions of the man, whose mother said he had a mental disorder, rattled nerves as Boston prepared for the annual race, but authorities said they did not consider it a security breach. Officials also expressed confidence in heightened security measures for Monday's event while acknowledging the challenge of protecting an estimated 1 million spectators and 36,000 runners across 26.2 miles and eight Massachusetts communities. Security plans include thousands of uniformed police, hundreds of plainclothes officers and about 100 strategically positioned video cameras that will monitor the crowds. Police also strongly discouraged spectators from bringing backpacks. "I believe this will be the safest place on the planet on April 21," said Dave McGillivray, the long-time race director for the Boston Athletic Association. Boston police detonated the suspicious backpack Tuesday night, along with a second backpack that was later found to have been left behind by a journalist covering the day's remembrances, Police Commissioner William Evans said. Neither bag was determined to have explosives. The 25-year-old suspect, Kevin "Kayvon" Edson, was arraigned Wednesday on several charges including threatening battery and possession of a hoax device. Bail was set at $100,000 and a judge ordered that Edson be evaluated at a state psychiatric hospital. Joie Edson said her son had battled bipolar disorder for many years and that his mental state had recently deteriorated. His lawyer, public defender Shannon Lopez, said he was diagnosed with mental illness at 19 and that a doctor said Edson showed signs of being off his medication recently. In a statement Wednesday, reports CBS Boston, Joie Edson calls this a "tumultuous and trying time for our family" and says they are "so sorry and emotionally overwhelmed by the events at the finish line of the Boston Marathon yesterday. To have this happen on the one year anniversary of such a horrific crime is unfathomable. My daughter and I have run the Boston Marathon six times for charitable organizations. It's a glorious event that embraces the spirit of friendly competition and good will. Crossing the finish line of the Boston Marathon is a feeling of accomplishment that cannot be described." She adds that her husband is suffering from late-stage cancer and that another son also suffers from mental illness. "We wish the runners of the Boston Marathon on Patriots Day a wonderful and celebratory day," Joie Edson says. "Run Strong and enjoy your wonderful feeling as you cross that finish line." 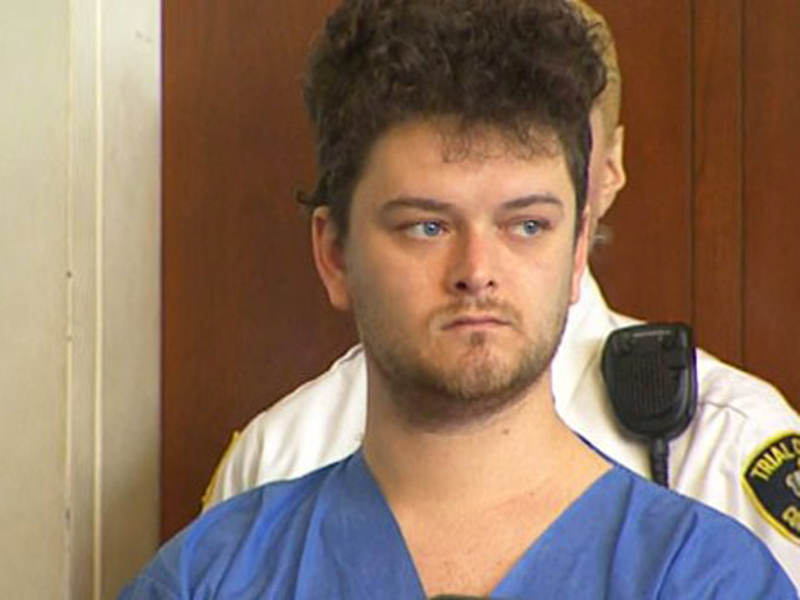 Evans said that Boylston Street, where the finish line is located and where twin bombs killed three people and injured more than 260 others last year, was not in lockdown when Edson walked down the street barefoot in the pouring rain, wearing a black veil and paint on his face. Along with the rice cooker, a robot mask was also found in the backpack, officials said. "That individual, like anyone, had the right to basically walk up the street," Evans said. Because he was acting suspiciously, however, police quickly intervened, he said. The finish line will not be closed to the public until the morning of the race, Evans said, but police planned to increase visibility in the area over the next several days. In seeking to discourage spectators from bringing backpacks, police said those carrying them are likely to have them searched. "This year, we can all understand that someone is going to feel anxious, nervous, to stand next to someone with a backpack," said Kurt Schwartz, the state's undersecretary of public safety. "Why do that this year?" Spectators were advised to tell a police officer or call 911 if they see anything they consider suspicious along the route. Evans said undercover officers with special training will be working the crowds looking for suspicious packages or anyone "who might be up to no good." He also said police plan to limit the size of the crowds on Boylston Street, and if they appear to be getting too large, people will be asked to move to other locations to view the race. But he added that police do not want to create undue anxiety, either. "We are not going to scare people and make it look like it's an armed camp," he said. The bombs at last year's marathon were made from pressure cookers hidden in backpacks, authorities said. Lawyers for the surviving bombing suspect, Dzhokhar Tsarnaev, were in federal court on Wednesday arguing that the government should not be allowed to monitor prison visits from the defendant's two sisters.